Three Vietnam War vets reunite after 30 years and embark on a bittersweet road trip to bury a young Marine killed in the Iraq War. War is dirty and destructive. That’s the clear and concise message in Richard Linklater’s war drama, which follows three Vietnam War vets who reunite after 30 years to bury a young Marine killed in the Iraq War. 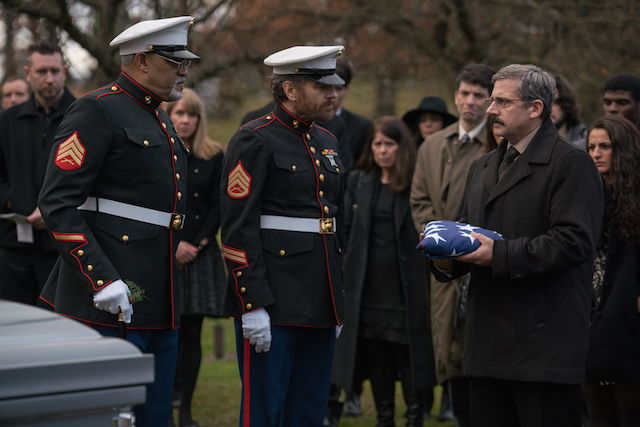 Based on a novel by Darry Ponicsan and set in 2003, the film starts off with Steve Carell’s character Doc, an introverted ex-soldier who needs to collect his only son’s body for burial at the military cemetery in Arlington, Virginia. Without much support (his wife recently died of cancer), he looks up two of his old buddies he hasn’t seen since they served in the Vietnam War three decades ago. Sal (Bryan Cranston) is now a cynical, alcoholic who owns a dive bar in Norfolk, Virginia and the other, Rev. 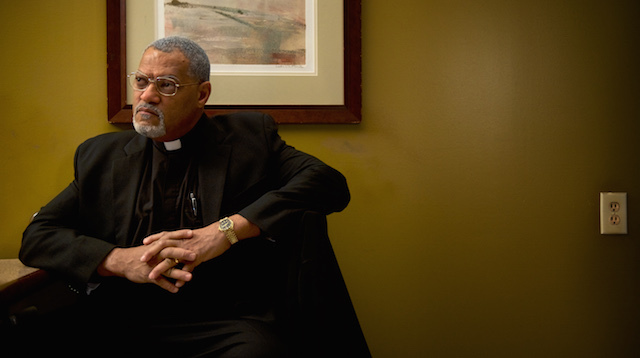 Richard Mueller (Laurence Fishburne), is a happily married family man and a charismatic pastor of a small, predominantly African-American church. After convincing the reluctant duo to join him on a mission to collect the coffin at the Dover Air Force Base, they set off on a road trip, but things take a drastic turn when Doc discovers the real circumstances behind his son’s death and dismisses the military’s plans to bury his son opting for a civilian burial in his hometown of Portsmouth, New Hampshire . This change of plans finds the trio, along with a young marine Washington (J. Quinton Johnson) who served with the dead soldier, hauling the casket up north on a train with stopovers in New York and Boston. Cicely Tyson (“The Help”) also has a small role as the mother of a fallen comrade the trio visit in Boston. 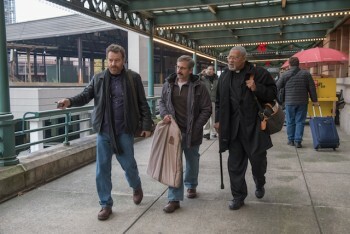 “Last Flag Flying” is not your typical Hollywood war movie. There are no bloody battle scenes or acts of heroism for the movie’s power comes from words; America sends our people into bad places and not always with good intentions or motives. A tad long, the beauty of this drama is watching the veteran actors at play. It’s a road trip theme, a fun buddy movie and an intimate friendship theme all rolled into one. All three characters have their individual quirks and it’s a joy watching the three commiserate, trade gibes, insults, reminisce about their tour of duty in Vietnam and debate the existence of God. Watching Mueller’s (Fishburne) pastor persona slips away after a few hours in the company of his former comrades is what draws the most laughs. 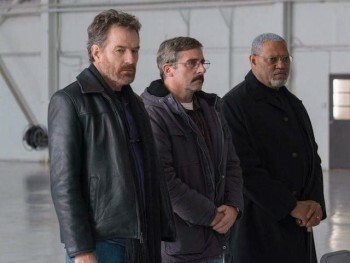 It’s a male bonding, road trip drama and although it deals with a devastating subject matter — the emotional and political impact of wars, director Richard Linklater (“Boyhood”) addresses the subject lightly, but directly, without gimmicks or gambits and it’s that juxtaposition of humor and tragedy that makes it a worthwhile film.